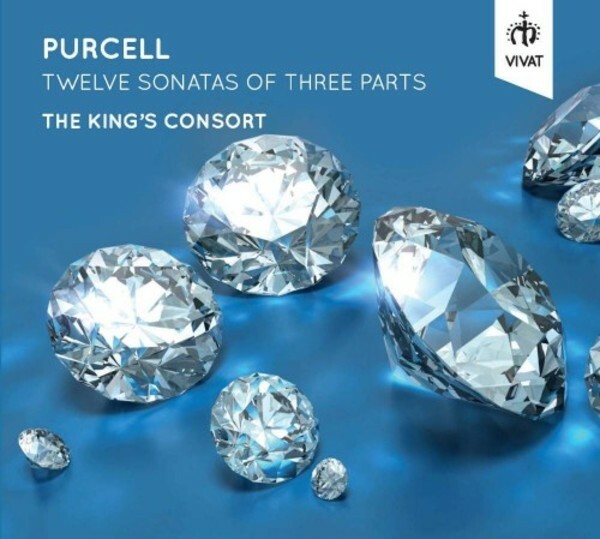 The tenth release on the Vivat label brings the latest in The King’s Consort’s acclaimed recordings of Henry Purcell’s brilliant chamber music: the Twelve Sonatas of Three Parts. Proudly published by the young composer in 1683, Purcell’s highly individual, extraordinarily inventive music combines French elegance, Italian vigour and delicious English melancholy with harmonic daring, extraordinary contrapuntal technique, ravishing dissonances and unique melodic invention. The King’s Consort holds a worldwide reputation as leading performers of Purcell. This new release follows the much-admired 2014 recording of the Ten Sonatas in Four Parts, and adds to The King’s Consort's 25 recordings of the composer’s music, which have won numerous international awards and been central in restoring Purcell’s music to prominence. Recorded in the glorious acoustic of St John’s Church, Loughton. Extensive presentation includes 44 page booklet with authoritative liner note in three languages by renowned Purcell expert and biographer Robert King, session photographs and reproductions from the 1683 first edition.